Since its creation in 2003, Green Cameroon has worked with communities, schools and other entities, to practically carry out and promote environmental conservation practices. Our series of environmental conservation projects carried out give us an out-standing track record which we are very proud of. Green Cameroon won its first award in 2007 for its work on using ICTs as a solution to environmental problems under the project “Green Technology“. This project is providing Forest Saving Stoves to community members of Mount Cameroon Region to fight forest degradation and conserve its rich biodiversity. In a community where 90% of inhabitants use wood for cooking and general household heating, it is important for wood to be efficiently used so as to give forests and woodlands enough time for regeneration. Save Mount Cameroon therefore provides community with these stoves for free as a means of encouraging them to switch from using the three stones fire places which they are traditionally accustomed to. “Save Mount Cameroon” as a project, will contribute to reducing rates of fuel wood consumption in seven village communities of the Mount Cameroon Forest Region. 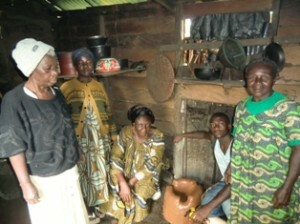 It involves the building and use of Fuel Efficient Stoves in these communities, training of community members in nursery establishment, management, tree propagation techniques and the putting in place replanting committees. The project seeks to address the loss of biodiversity brought about by a decrease in forest cover observed in this forest region due to community’s constant increasing demand for wood as a source of energy for domestic and industrial use. By use of the fuel efficient stoves, community’s wood consumption will be reduced by up to 50 % leading to lower rates of exploitation and allowing more time for forest regeneration. The training programme on nursery establishment, management and tree propagation techniques will ensure the availability of tree seedlings and constant replanting mechanism in these communities. The villages of Bokwango, Bwassa, Boteva, Ewonda, Bova I, Bova II, Bonakanda are all communities found on the foot of Mount Cameroon which is the highest peak in West Africa and a biodiversity hot spot. More than 90 % of community members here use wood (fire wood) as their main source of energy for cooking and domestic heating. The main economic activities here include farming, hunting and the sale of fuel wood to urban centers. Indiscriminate harvesting of trees and the absence of a constant replanting mechanism in these communities poses a big threat to its rich biodiversity. 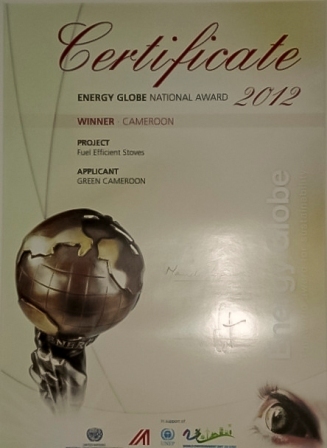 For this project, Green Cameroon won the National Energy Globe Award for Sustainability 2012. Here we engage in educating communities on the causes and effects of climate change both at local and global levels, development of resilience techniques and advocating for better mitigation policies. Our reforestation and sensitsation projects all come under this category. Projects here center around equiping community members with the knowlledge needed to combat climate change, better adapt to the effects of glabal warming through the implementation of practical hands-on activities. 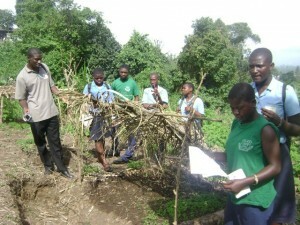 Green Cameroon between 2010 and 2012 carried out a study of common medicinal plants of the Mount Cameroon forest region. This studies led to the production of a book ( yet to be completed and published) on these plants, photos for identification, illnesses they treat and the parts used. Another phase of the project as envisaged by the team was to come out with information in book form on how to practically use these plants in the treatment of some common diseases and the knowledge shared in communities. To facilitate this studies a medicinal plants garden was established on the Campus of GHS Buea town with a collection of more than 200 medicinal plant species of the Mount Cameroon Forest Region. This garden served as a study ground for many researchers and even students during its existence. This project was halted when in early 2012 some unknown students invaded the garden and cut down almost all the plants. It was later on discovered that the Senior Discipline Mistress of the School had punished some students to do grass cutting around the garden and they used the plants as a target to express their anger by cutting them down. Green Cameroon’s Management therefore decided to put the project on a hold till such period when it would have a suitable piece of land of its own where more security would be guaranteed for the plants. The Green Cops Programme was launched between 2008 and 2010 and was a sanitation campaign aimed at fighting against littering on secondary and high school campuses. It was common for students to drop pieces of papers, food crumbs and other forms of waste just any where on campus and this campaign was our proposed solution to fighting these bad practices. Through the program, special students where chosen and made as sanitation police men at the level of the schools. These students where in charge of walking around the campus when ever they were free and making sure that who ever dropped dirt on the ground picks it up and drops in the trash can or dust bins. If a student failed to comply they where punished by the administration in one way or the other. These Green Cops where given badges to identify them and most of them we proud to be doing something considered to be important to the environment and support by the school authority. This project was a pilot project, applied just in one school and was also halted because of shortages in staff at the level of Green Cameroon. Given the Recent increase in staff strength, there are high probabilities that the project might once more go operational and this time in more schools with better results too.